Vegan Momma Monthly: Why Am I So Tired? *Question: "Why am I so tired and how can I fix it?" 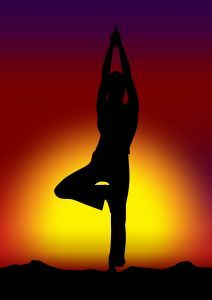 There is an overwhelming amount of positive information about prenatal yoga from pregnant women. It is one of the most popular forms of exercise during pregnancy because it helps to prepare the mind, body, and spirit for the new pregnant body and for childbirth. Pregnancy yoga increases muscle flexibility and breathing capacity, and reduces swelling in joints and lower back pain. It can help prepare you psychologically to focus and look inwards when it comes time to give birth. And, it's great for people of all experience levels. Read more about the huge benefits of pregnancy yoga. 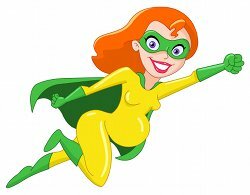 Our superheroine food of the month is Red Raspberry Leaf Tea, a homeopathic remedy for uterine health that has been used for hundreds of years. Many women absolutely swear by the herbal tea, and are sure it helped them to have more efficient and effective natural childbirth. Why does red raspberry leaf tea work to strengthen and tone the uterus, when should you start drinking it, and where do you find it? Find out on our site. Question: "Why am I so tired?" Many women suffer from low energy during pregnancy, especially during the first and third trimesters. With the wild swings in your hormone levels, some of the fatigue is inevitable, but there are a few tricks to keeping it at bay. Meredith wrote to us and asked what she can do or eat to increase her energy levels in pregnancy. 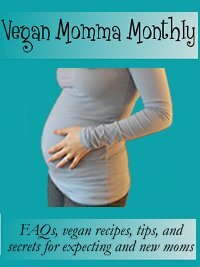 Have unresolved questions about vegan pregnancy and raising vegan children? Join in the discussion on our site by asking and answering questions, as well as commenting on other answers. It's fun and helpful! 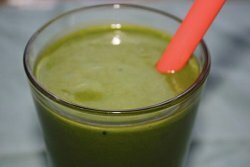 One of my favorite vegan breakfast recipes is the Green Goddess Smoothie. It's perfect for pregnant women who want to ensure they're getting plenty of greens into their diet, but it also works perfectly for those who are breastfeeding, short on time and in need of quick recipes, and for a fun vegan recipe for children. If you're never made a green smoothie, you should definitely check out this awesome, easy vegan breakfast recipe.